On the Fifteenth Day of December . . .
Today was one of those days. It wasn’t the worst day I have ever had by far, nor was it the best day, either. It just seemed like at every turn, I kept running into minor setbacks and obstacles. By the end of the day, my positive attitude and resolve were worn thin. So, what’s a girl to do at the end of a long Monday? Stop at the local cable television office to exchange faulty equipment, of course! Man in line: This is ridiculous! You would think that with how busy they are that they would have more than three people working behind the counter. Woman in line: It could be worse, we could be at the end of the line. It will be our turn soon enough. Man in line: We have already been waiting over twenty minutes. Ridiculous! Woman in line: You know, if this is the worse thing that happens to us today, we are lucky. We are waiting inside a warm, safe place with other nice people, and when we walk out, we get to go home and enjoy dinner and an evening together. Waiting in line seems like small potatoes. With that, the man in line fell silent, and while his attitude and demeanor didn’t seem to change immediately, mine certainly did. The woman’s words hung in the air and then found their way to my heart and mind. As I reflected on my “bad” day, I recognized that nothing that had happened was life altering or earth shattering, and in the grand scheme of things, today’s minor inconveniences would be long forgotten soon enough. 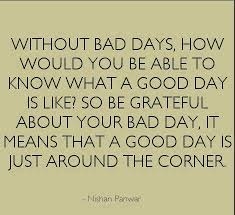 As I began to focus on all of the things that went well today and all of the positive people and things in my life, suddenly, my “bad” day seemed pretty good after all. It also didn’t hurt that the cable television customer service representative was able to get me a lower monthly rate! Thanks so much, and she definitely was my kind of person at just the right time! Early morning bloggers we are. Have a great day. Exactly! Standing in line at a cable television office is nothing compared to the recent atrocities in Pakistan. That definitely puts things into perspective in a very jarring way. Let there be peace on earth. A great reminder to put small inconveniences in the waste bin where they belong. Love that description, Elizabeth, and I agree! This is one of the best scenarios I’ve read which puts life in perspective. Thanks so much; I am glad that you liked it!